How can I tell if my emerald is natural or synthetic? 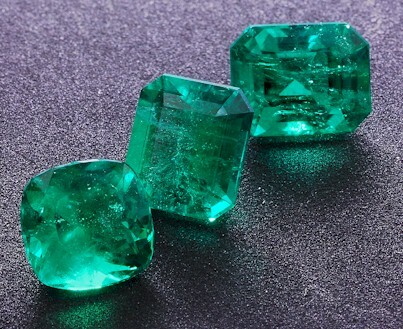 Separation of natural from synthetic Emerald can be difficult. This is because the chemical composition and optical and physical properties are nearly identical to those of natural Emeralds. Some of the more recent synthetic techniques also involve placement of natural-looking inclusions, typical of natural Emeralds, in the created gemstone. If a very vividly intense green Emerald, very clean and brilliant, is presented to a potential buyer as a "real" Emerald, and the cost is less than USD 500.00 a carat, the buyer should be aware that this is not a realistic price for a natural Emerald of that quality. Technically, it is not incorrect to present these created Emeralds as "real" Emeralds, as they do have the same chemical composition and structure as a natural Emerald. The important question to ask is "is this a natural or a created Emerald?" Most dealers will concede at that point that the Emerald is created; it would not be ethical to present a created Emerald as a natural Emerald. Actually, though technically correct, it is misleading to present a created Emerald as a "real" Emerald, and sellers who do are misleading the public. 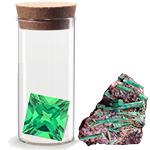 If you wish to determine if an Emerald in your possession is a created or a natural Emerald, it should be taken to a competent Laboratory for analysis. Because of the similarities between the two mentioned above, the separation between created Emeralds and high-end natural Emeralds should be left in the hands of qualified gemologists who possess the analytical instruments necessary to make the distinction between the two. Colombian emeralds will typically be the most expensive followed by Brazilian and Zambian stones. The reasoning is related to the color. Colombian emeralds get their color primarily from the trace amounts of the element chromium which is responsible for some of the purest greens in gemstones. Brazilian emeralds get their color primarily from trace amounts of the element vanadium and Zambian emeralds get their color from iron. Brazilian emeralds typically have a slight brown or gray cast and only sometimes match the pure green hue that many Colombian emeralds offer and Zambian emeralds often appear too blue due to their iron content. In reality though, emeralds from all three sources may be colored by more than one element. What are the physical properties of an emerald? What are the optical properties of an emerald? What determines the value of an emerald? What is the history of emeralds? How are emeralds associated with birth date? What other natural gemstones look like emeralds? How are created or synthetic emeralds made? What enhancements are used on emeralds? How should I care for my emerald?